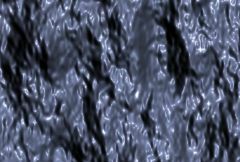 Creates an abstract texture by applying a EmbossShiny effect to a procedurally generated noise texture. Adjust the Light Dir to illuminate the pattern from different angles. Mask: Optional. If provided, the emboss is applied only at the areas specified by this input. This input can be affected using the Blur Mask, Invert Mask, or Mask Use parameters. Light Dir: X & Y, Default: screen upper right.